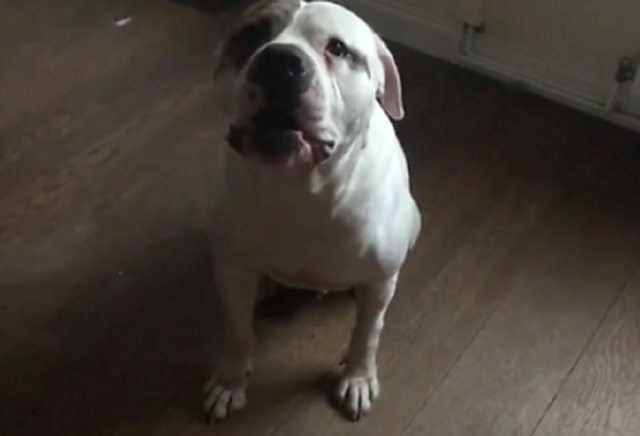 Eric is a 7-8 year old male American Bulldog Cross. 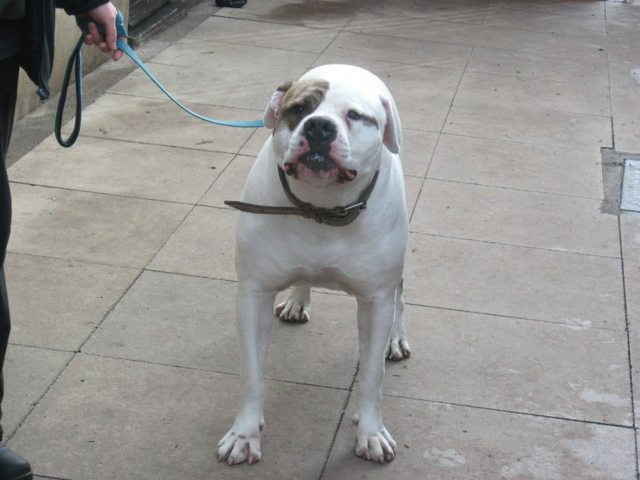 Handsome Eric is a Heinz American Bulldog with a white silky coat and one brown patch on his eye. He is of medium build. Eric is obviously a very handsome chap: fit, very strong, loyal and loving. Eric will be looking for a new home without young children, as Eric is not used to them and would send them flying. Loving boy and very happy to get fuss and attention, likes his food and eats well. Can live with other dogs. Eric is obviously a very handsome chap: fit, very strong, loyal and loving. Eric will be looking for a new home without young children, as Eric is not used to them and would send them flying. Loving boy and very happy to get fuss and attention, likes his food and eats well, can live with other dogs. In kennels in the Bradford area. 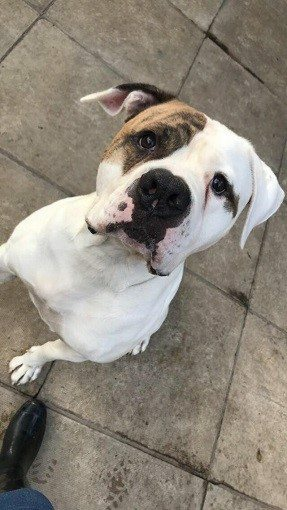 Foster Report: Eric has had an awful life, which has left him with a whole list of issues and so he will need an understanding home that will love and nuture him. In short, Eric’s main issues are: food aggression; guarding the home when strangers come and knock at the door; a fear of bottles and drinks in cans (mainly alcoholic drinks but also soft drinks that could be similar to appearance of alcoholic drinks); police officers and people wearing high viz jackets. Eric also did not like to be bathed previously but has since become OK with water. Eric, did spend time in a foster carer’s home where he lived with another dog and they spent many hours playing together, but he can be reactive to other dogs on walks, so will need to wear a muzzle. Eric will need a new family where there is a man in the home, as Eric can be a dominant boy. Eric will be looking for a new home without young children, as Eric is not used to them and would send them flying and due to his food aggression. 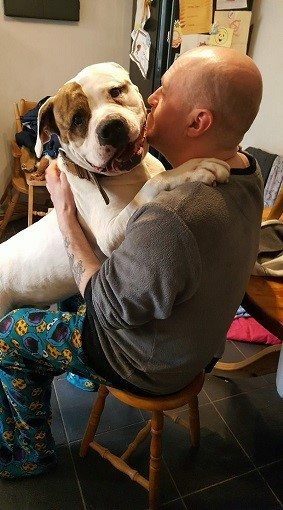 Eric is obviously a very handsome chap: fit, very strong, loyal and loving and, despite his issues, Eric adores his cuddles and has a lot of love to give. Eric is in kennels and has been for some months so could do with finding his forever sofa.